U.S. 70 between Raleigh and Morehead City plays importants roles, including being a primary hurricane evacuation route as well as being a major corridor for freight transport. Future Interstate 42 generally follows the U.S. 70 corridor southeasterly, connecting Garner, Clayton, Smithfield, Selma, Goldsboro, Kinston, New Bern and Havelock with the Port of Morehead City. I-42 will begin at the current systems interchange with I-40 near Garner and follow U.S. 70 southeast toward Smithfield, Selma and I-95. Near Goldsboro, I-42 will overtake the U.S. 70 Bypass around the north side of the city. A new bypass will carry I-42 around the south side of Kinston, connecting with the existing controlled-access and freeway portions east to New Bern. Southeast of New Bern, Future I-42 will follow another new bypass to the west of Havelock. Ultimately I-42 will end near the Port of Morehead City. In addition to connecting Morehead City with the Raleigh area, I-42 would also link Seymour Johnson Air Force Base and Cherry Point Marine Corps Air Station to the Interstate system. U.S. 70 Goldsboro Bypass – from just west of N.C. 581 in Wayne County to just east of Promise Land Road in Lenoir County. Built in three stages, the western half of the 20-mile bypass was complete from U.S. 70 in Wayne County to Wayne Memorial Drive by October 2015. The remaining 12.5-mile connection back to U.S. 70 in Lenoir County opened May 27, 2016.4 An additional 6.7 miles of U.S. 70 will be upgraded to Interstate standards starting in 2023, from the Goldsboro Bypass to Princeton. U.S. 70 Kinston Bypass – previously unfunded per the NCDOT 2016-2025 State Transportation Improvement Plan.2, the 2018-27 plan allocates $379 million for the project. A southern alternative of a U.S. 70 bypass near Kinston was preferred over several northern alternatives. Estimated costs were $181 million.2 The preferred alternate will be selected in February 2019, with contruction anticipated to begin in 2025. U.S. 70 Improvements in James City – this project will make improvements to the U.S. 70 corridor through the James City area from south of the exchange with U.S. 17 to south of Garner Road. Construction on the $171.6 million project commences in early 2020 and wraps up by earler 2024. U.S. 70 Havelock Bypass – from north of the Havelock City limits and extends south for approximately 10 miles to north of the Craven-Carteret county line. At an estimated cost of $221.26, the limited-access bypass is expected to begin construction in February 2019 with a completion date in 2022. Proposed Interstate 42 is part of the Fixing America’s Surface Transportation (FAST) Act high priority future Interstate corridor, which is designated as Corridor 82. 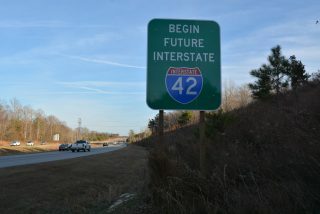 Future Interstate 42 corridor signs were posted at the eventual west end of the route along the Clayton Bypass in 2016. Photo taken 12/15/16. Also, unlike Interstate 36, the Interstate 42 designation will fit into the Interstate system number grid, following a path completely north and east of I-40. The eastern end of Interstate 42 will connect with U.S. 70 in the Morehead City area. The easternmost freeway portion planned thus far is the Havelock Bypass, which will tie into U.S. 70 north of Newport. 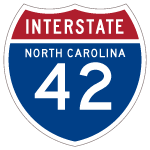 Interstate 42 will end at the trumpet interchange (Exit 309) joining Interstate 40 and U.S. 70 (Clayton Bypass) between Garner and Clayton. U.S. 70 Kingston Bypass, NCDOT website. Strategic Transportation Investments, NCDOT website. “North Carolina Gains Names for Two New Interstate Designations.” NCDOT website. “U.S. 70 Goldsboro bypass opening Friday”, www.witn.com (news and TV). Page updated May 25, 2016.